Although most of us tend to think of plants as no more aware of their surroundings than inanimate objects, they do react to their immediate environment. One of the best examples of this is the sensitive plant (Mimosa pudica): a plant that abruptly moves away when it is touched. 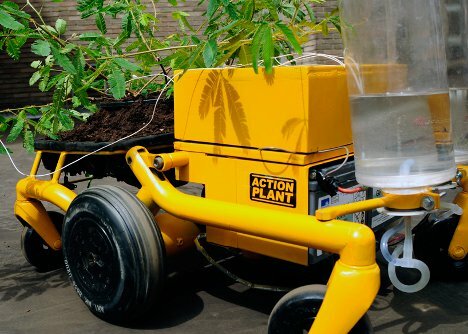 Using the unique sensitive plant, Brazilian artist Ivan Henriques created what might be the world’s first mobile cyborg vegetation. Henriques calls it the Jurema Action Plant, or an interactive bio-machine. 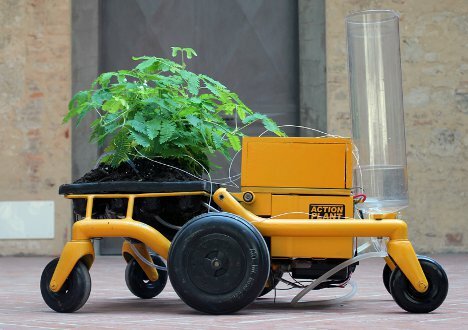 The setup consists of a sensitive plant rooted in the bed of a motorized toy truck. A signal amplifier detects the plant’s defense response and exaggerates it, which triggers the custom circuit board to move the entire contraption away from the stimulus. Attached water tanks keep the plant hydrated while it does all of this running around. Judging from the project’s video, the plant does not move away from stimuli quickly enough to avoid any actual danger – a determined predator could chase it down pretty easily. But as an art project, it is an interesting look into the level of environmental awareness plants possess. See more in Cybernetics or under Technology. May, 2012.